Thai Vegetable Stir-Fry with Beef or Chicken — kids love this recipe! I told you in my meal plan from the other day that tonight was stir-fry night. I had planned to use round steak to save a trip out to the farm, but that would’ve been tough and not so great, so thankfully I remembered I had a couple good flank steaks in the freezer! I threw them frozen into a two gallon freezer baggie and marinated them for a couple days and was it ever yummy. This marinade is so tasty, I'm sure you can use it on whatever kind of meat you have on hand. You can keep it grain-free, or serve over pasta or rice. 1 Tablespoon mild curry paste (mine also has cumin & cilantro in it) — note that the kind I used didn't have any questionable ingredients, but the ones I see online have stuff I do NOT like, such as canola oil (yuck), so be sure to check your ingredient labels. Meat of your choice, pastured meats are best. This is good with steak or chicken! Pork would be good too. 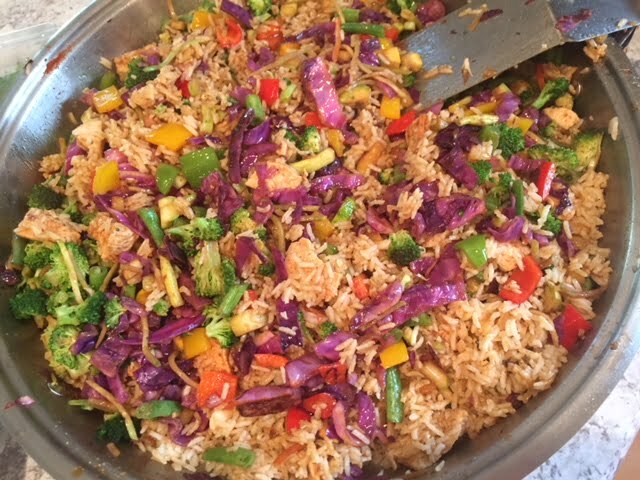 Whatever veggies you have on hand that your family likes, cut into bite-sized pieces: broccoli, carrots, peppers, cabbage, green onions or regular onions, etc. Mix together the first 7 ingredients and marinate the meat in it. Longer seems to make it really tasty, but several hours would probably be fine. (Or if you forget like I often do, just cook the meat in a pan with the sauce ingredients.) If you feel like you don't have enough marinade, then double or triple your recipe. Before cooking your meat, cook your pasta so it will be ready for you at the end of the recipe. You can cook the meat in this sauce, and add the veggies just a few minutes before it's time to eat, OR throw the meat on the grill (indirect heat) and toss everything together last. Retain the marinade and put it into the pan you’re using to stir-fry veggies. I used my favorite stainless steel electric pan. I started the carrots first because they take a few minutes to get soft; the others take a shorter time, but be careful not to overcook or they’ll end up mushy. I also added a few Tablespoons of unflavored coconut oil when it looked like the sauce was starting to stick to the pan a little. It needed more sauce so I threw in more of all of the above ingredients (it doesn’t have to be exact, but basically I just doubled it), along with a palm sugar to taste, about 2-3 teaspoons. Taste it and see what it needs. 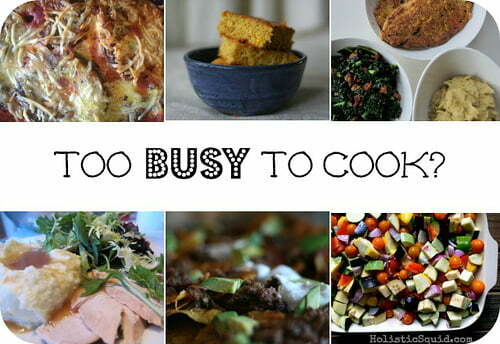 Once your veggies are close to being done, throw in your sliced meat and cooked pasta and mix well. Enjoy! Surprisingly the kids were all over this. They ate more steak than veggies, of course, but we also had fermented carrots and leftover squash with it. 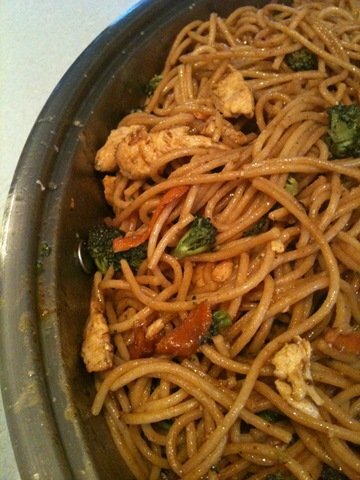 This is another picture from when I made it with chicken strips and whole wheat spaghetti pasta (add even more sauce if you’re serving it with pasta, just double or triple the above recipe, depending on how many you’re feeding). Though this Thai Vegetable Stir-Fry with Beef or Chicken is good, the kids probably like the flank steak best, we had it over rice, so it was gluten-free. Isn’t there canola oil in pataks curry paste? Dang, looks like it does, Melissa Schaller! Good call! This is another brand that does not contain canola oil and it’s also less expensive: https://amzn.to/1TO9OYk (they have a variety of Thai curry pastes). Kelly, I lost your link to the over the counter water filter you liked. Could you share again? thanks! Thank you Kelly! Do you use this? No, I had already invested in another system before I learned about this one. But my friend who told me about it will write a review for me soon. Where did you get the fermented soy sauce? Thanks for being here for all of us! Really appreciate it! Looks great! I’ve copied it to try when my big pail of pb arrives, though I may see how almond butter works in the mean time. Yum. I just copied and pasted this and printed it out. I can’t wait to try it. 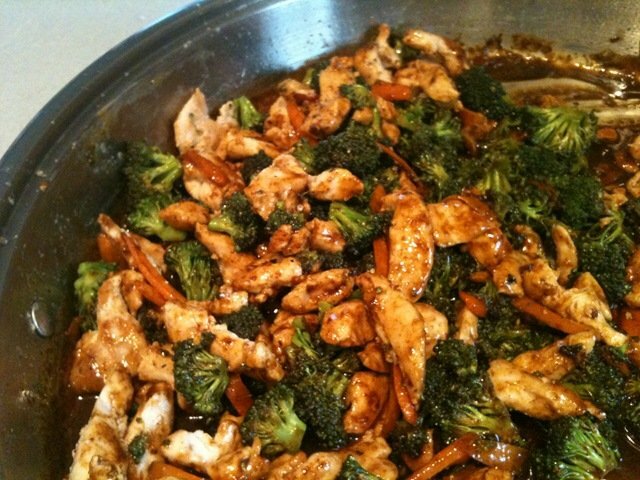 We love stir fry but I usually use chicken and I’ve never tried a Thai version. I think this will be a sure hit!